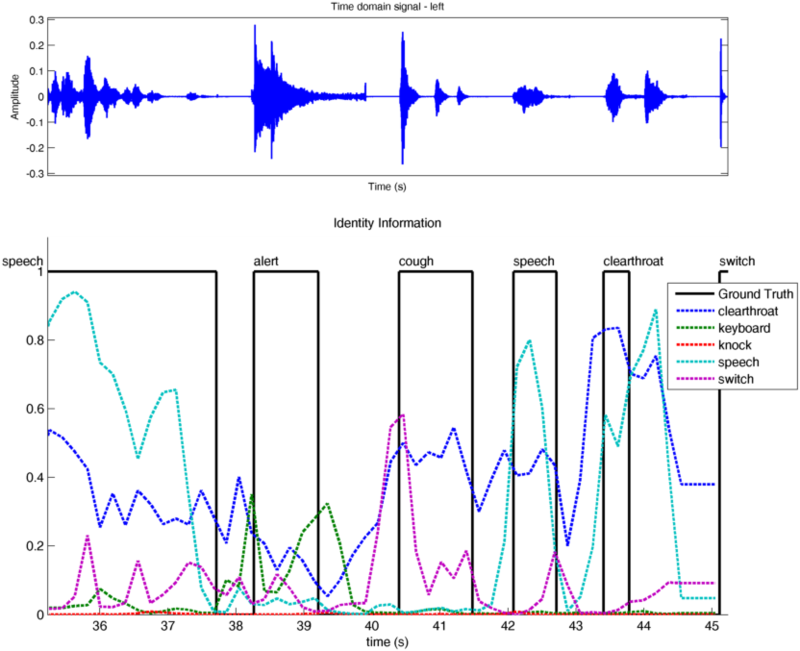 Using identity knowledge sources with source type models to generate hypotheses about the type of sound objects in an auditory scene. To dive into the example, load up Matlab, navigate into the example directory, and open identify.m, which contains a function (also usable as a script without arguments). Let’s have a look before firing it up! The function identify takes a parameter, which shall specify the models to be used for source type identification. However, for this example, you can run without setting this parameter, and let the function setDefaultIdModels do this for you. This function specifies six source type models by giving the directories they are located in and the class they are trained to identify, respectively. To test the identification models, a test scene is compiled from audio events (IEEE AASP single event sounds database) from several wav-files, listed in shortTest.flist. All those wav-files have not been used for training of the tested models (the models have all been trained using the same trainset), so the models have never “seen” (or better: “heard”) these actual sounds. The function makeTestSignal not only compiles the audio, but also reads the “ground truth”, i.e. the on- and offset times of the respective events from the annotation files. The scene is about 45 seconds long. The events are concatenated in random order (with 0.5s inbetween two events). The next code paragraph deals with initialisation of the Binaural simulator. More specific, the acoustic sources are set to a head-relative azimuth of zero degrees and three meters distance. Free-field conditions (no reverberation) are set through absence of a room definition (either in the SceneDescription.xml or in code). The models have been trained under the same conditions. The IdTruthPlotKS gets bound to the identity knowledge sources, which produce the identity hypotheses. ....Identity Hypothesis: clearthroat with 75% probability. ....Identity Hypothesis: knock with 0% probability. ....Identity Hypothesis: switch with 6% probability. ....Identity Hypothesis: keyboard with 0% probability. ....Identity Hypothesis: speech with 89% probability. You can see the before installed event bindings in action – the scheduler triggers the AuditoryFrontEndKS, which triggers the IdentityKSs, which place identity hypotheses on the blackboard and trigger the IdTruthPlotKS. Fig. 76 This is the live plot of hypotheses created by the identity knowledge sources, in comparison to the “ground truth” (as given by annotated on- and offset times for the source sound files). The relative error rate here is the over time integrated difference between ground truth and model hypotheses (divided by the length of the simulation).